I was going to do a flower arrangement because that's what first popped into my head, but then I couldn't find one that I really liked. Then I thought I would do something completely new, but again was at a loss for a subject. This morning I was making waffles. 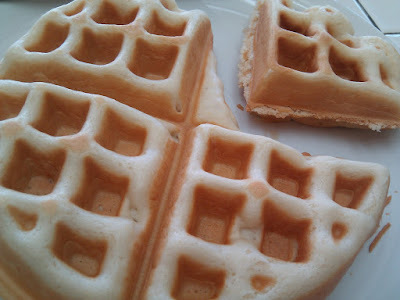 It turned out that there was 1/4 left from one and the last of the batter only made a 3/4 waffle. I put it on the plate and voila! A Pac-Man like creation "arranged" on the plate. More fun than flowers any way.